Belle 3 chambres, 2 salles de bain, garage 2 voitures avec la maison solaire de piscine chauffée dans un quartier calme et agréable. Une fois que vous marchez dans vous vous sentirez comme à la maison. Nous vous fournissons toutes les commodités essentielles pour rendre votre séjour le plus agréable possible. La gestion de la propriété vous soutient avec des conseils, des coupons, des fournisseurs locaux et beaucoup plus pendant vos vacances à tout moment. Supermarchés, épiceries, banques, ATM, cinémas et centres commerciaux sont situés à 5 minutes en voiture. After a long drive we were allowed to check in a couple of hours early, which was nice.The house was clean and spacious. Very quiet neighborhood. The kitchen had all we needed. There was dish soap, bath soap, shampoo and conditioner, and all the linens you would need. Even beach towels and chairs for your excursions to the many beaches in the area. I am glad I brought coffee for our first morning.We did have to go grocery shopping just as you would at home, as we were staying for a month. The beds were very comfortable. Both the air conditioning and heat worked. The outside temps varied. The pool never warmed up enough for us to use because of colder temps at night. How ever the lanai was used and sitting in the sunshine was so nice. There are some very nice restaurants in the area or short drive away. Recommend The Three Fishermen, Bubba's, Mel's diner, Ford's. And then there is EVERY single one of the chains you see everywhere. Walmart, Publix, Winn Dixie, and all the other stores are near by also. It would have been a plus if the two bikes were in working order, but could be only used near the home, for exercise and certainly not to the beaches, so not a big deal. Staying that long we made use of washer and dryer and the internet. We missed the sub zero temps at home which was just what we were aiming for. The house was spacious, clean, renovated. There was plenty of room for 4 adults and one child. We visited state parks, beaches, botanical gardens, etc. We had a good time. The bathroom in the master en-suite needed work. The shower tap needs replacing as it just turned and turned and much guessing was needed to obtain the correct temperature. The shampoo/body wash/conditioner dispenser was missing. The kitchen was adequate but not equipped for anyone doing a lot of cooking or baking, which we did not do with so many great eating places nearby. The yard needs a good cleanup as does the lanai floor. There were several holes in the "cage" screen over the pool but this did not hamper our enjoyment of the pool. We would imagine that the above work will be done during the "off season" as it would be impossible to work on the cage or lanai while the house was occupied. The location was excellent, quiet, and we were readily able to get to the stores in the nearby Publix plaza. We were pleasantly surprised at how nice the interior was finished upon arriving. The convenient location helped us enjoy the entire region. We will stay here again. This Cozy/Unique Vacation Home is located in very nice quiet neighborhood . Isabel is extremely friendly and beautiful . 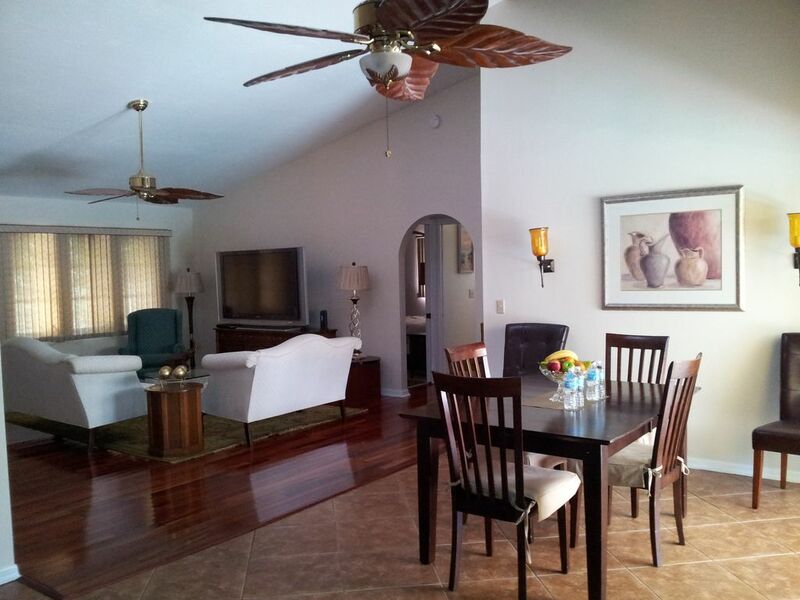 Clean, spacious, great vacation rental! We were very happy with this house. It was very clean and worked well for our family to stay there while vacationing in Florida. Convenient location to many attractions (Edison & Ford Winter Estates, 6 Mile Cypress Slough, & 4 Mile Preserve). It is in a very quiet neighborhood and we enjoyed having the pool (best time to swim is in the afternoon). The kitchen is nice though it could use a few more cooking utensils and spices since we cook a lot of our own meals. Overall we thought it was great and would certainly recommend it!!! Thanks Isabel for meeting us at the house and showing us around and also giving us suggestions on what to see and a few favorite restaurants in the area! Cette maison de vacances confortable est dans un coin terrain privé, à distance de marche du parc riverain, épiceries, restaurants, église, salle de gym, etc. Prices are for up to 4 guest. Add $100 per additional guest for the stay, with a maximum occupancy of 6. ***If paid with Credit Card there will be a 2.5% fee for US Cards. 3.0% for Foreing Cards **If you pay by E-Check it's free of charge. I also accept bank wires. Please contact me before payment.